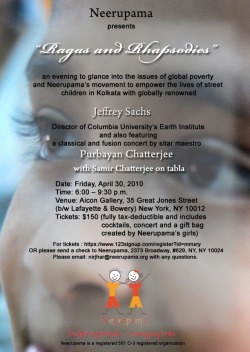 The non-profit organization Neerupama organized a tasteful event at the Aicon gallery in New York City on Friday, April 30, 2010 to raise funds for their organization while giving its guests a glance into global poverty and it's movement to empower the lives of street children in Kolkata. 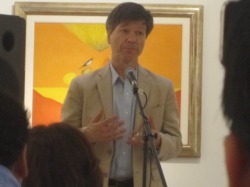 The event featured renowned director of Columbia University's Earth Institute, Jeffrey Sachs who discussed the issues that surround global poverty. 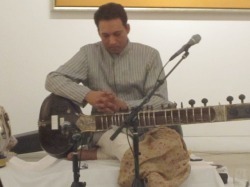 After the moving speeches and getting a glimpse of the movements in process in helping to eliminate poverty and educate the underpriviledged, guests were given an incredible classical and fusion concert by sitar maestro Purbayan Chatterjee and tabla player Samir Chatterjee. Guests were treated with champagne, wine and Indian appetizers, and got a chance to take home a gift pouch made by Neerupama's students. 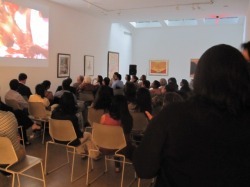 Neerupama is a 501 C-3 organization, founded in 2008 with the goal of empowering street children to realize their potential using muti-media tools and resources. 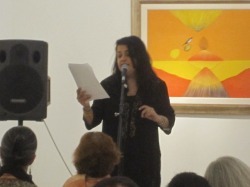 They currently work with street children in Kolkata and Mumbai between the ages of 5-14 to deliver programs in English literacy, basic math, disease prevention as well as in the performing arts with the goal of supporting Neerupama's children to avail higher education and employment opportunities.